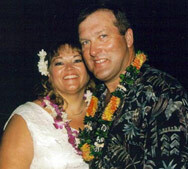 Our First trip to Maui Jan 2003, we had found Kay online and she was very helpful for our Vow Renewal. From photographer, flowers to great beach info, she thinks of things you wouldn’t to make our day very special. She has been helping us with our trips each time we go to Maui. She books our Luau and our trips on the 4Winds Boat for our Molokini snorkel trips. We have discovered her favorites are our favorites. She is always available for advice on restaurants, to beaches. Thank you Kay for always making our trips very special. We wouldn’t do a trip without her. Thank you again for the reservation service you provided for our trip to Maui in October. We had such a wonderful week there, and the arrangements were perfect for us! The flight arrangements were just what we wanted, and the condo hotel in Ka’anapali was just the ideal place for us, and we enjoyed it so much. Still can’t believe how nice the people were at the Castaway Cafe, and how much we enjoyed the beach, the garden like grounds, and the general area we were in. The whole thing was a dream come true, and a time that we will always remember. Our thanks to you for caring about our trip, listening to what we wanted, and making arrangements that were just ideal for us. Merry Christmas! God bless you and your family with love, joy, health and abundance, now and in the New Year! I want to thank you for our great time in Maui. All of our activities were perfect. We loved the snorkeling trip–got to see turtles, whales, and dolphins! The luau was so much fun. The bike trip was beautiful, but our guide was a bit strange–Jim, we still joke about him. Anyway, thank you thank you thank you! Tell your daughter that she gave the best hula. We are now back in New York and wish to take a moment to thank-you for your efficient and quick response to our travel request while in Oahu. Please know that everything worked out just fine and as planned during our stay in Maui. In fact, we were fortunate enough to obtain an upgrade to a deluxe ocean room while at the HYATT and were pleased to find everything in order with regards to our Aloha flight and car rental arrangements. We are grateful and wish to thank-you for a job well done and handled in a very professional matter within such a short notice. Jon’s Maui info website was right and should we return someday to Hawaii, we would not hesitate to use your services again. In the end, the weather turned out to be fantastic and we were able to go up the Haleakala during a full moon and witness a spectacular sunrise. As if not sufficient, we continued to contemplate our breathtaking experience of the day while being once more enchanted in the evening by David Paul’s absolutely exquisite cuisine. We wanted to say THANK YOU SO MUCH for all your help with our trip to Maui. After our initial phone conversation and the condo info you so quickly sent, we knew all would be well. You made the whole process so easy, we loved the place and the fact that you kept in contact and made yourself available at all times. It’s so nice to know that there are people like you who enjoy their careers and really care about people. We couldn’t give you a higher recommendation or a more sincere thank you. We only regret that we couldn’t stay longer and that we didn’t have a chance to meet the person who made our fabulous trip possible. Have a great summer there in paradise. Just wanted to drop you a note thanking you for a great week of events on Maui. The family and I had an unforgettable experience and will cherish the memories for a lifetime. The snorkel trip to Lanai was just what we had hoped for and the crew was excellent. Mitch will never forget his 400′ parasailing experience and now wants to add an 800′ sail next time out. Our renewal was exactly what I had envisioned. Scott and Howard made the occasion a very memorable and special time for the family and I.